SPACE OPERA includes complete rules for character and planet generation, human and alien races, skills and professions, starships, individual and ship combat, etc. Also included are summary charts, tables, ship and planetary record sheets and character reference sheet. SPACE OPERA is the most complete science fiction role playing game ever produced. SPACE OPERA is a science fiction role playing game. 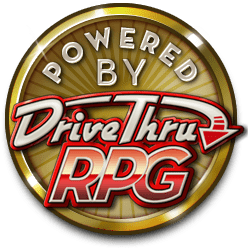 Players control characters who may be star pilots, scientists, soldiers, merchants, explorers, space marines, or any one of a number of other professions. These characters have adventures in a galaxy designed by the StarMaster who referees the game. 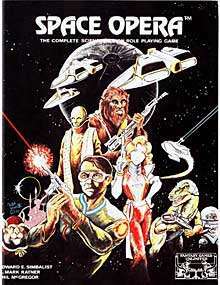 SPACE OPERA adventures may be interwoven over several game sessions to play out the lives of the characters involved in this fascinating game of action and interaction. VOLUME 1 covers the generation of characters, their attributes, skills, career possibilities, and the effects of their planets of origin. Variations for alien races are presented. Psionic talents are explained. Details for running, maintaining and repairing a starship are given. Five starships, complete with deckplans are provided. Volume 1 is 90 pages long. VOLUME 2 presents a wide selection of equipment and weapons for a variety of technological levels. Combat, both on the ground and between starships is covered. Detailed sections on starship design, world creation, interstellar travel and commerce, and planetary cultures fill out the book. Volume 2 is 91 pages long. An assortment of master record forms and a selection of useful charts are also included. For you as a player, SPACE OPERA offers a selection of species for your character. From a basis of randomly determined characteristics (slanted to favor your character) you take him through his career up to the point when his adventures start. This development system results in a complete and rounded character with skills chosen in a nonrandom fashion to suit his or her needs. For you as StarMaster, SPACE OPERA offers rules covering a wide variety of topics from which you may pick and choose those that will best suit the universe in which you wish to play. In this way you can simulate situations from virtually any part of science fiction literature. SPACE OPERA gives you a framework within which to set and develop the adventures that you conceive for the characters. The only limit is your imagination. SPACE OPERA requires one person to act as StarMaster and is most enjoyable with 2 or more other players. The rules present a detailed, and in some areas intricate, simulation of a science fiction universe which is a blend of scientific fact, postulated future science and just plain imagination. It is a scan of that edition. Is this the same as the 1982 edition? Ive got a copy of the old one and it sure looks like it. Definitely seems to be a direct scan of the original game.